A metal shovel light enough for racing? ARVA says yes, it's possible, with the new Ultra. Weighing just 302 grams (10.7 ounces), this ISMF compliant digger features a carbon fiber shaft that easily snaps into a svelt aluminum blade. When disconnected, the parts are slim enough to stow easily in a race pack. If you're not quite comfortable carrying a kids' toy during a race, the ARVA Ultra gives you a more robust option. Either way, we're still hoping there are no burials during a race. Blade is made of aluminum and measures 21 centimeters (8.3 inches) square. 46 centimeter (18.25 inch) carbon fiber shaft provides decent leverage when digging. Scoop is shallow for ease of packing and features holes for building anchors or sleds. Fully complies with International Ski Mountaineering Federation rules for certified races. Update for 2018/19 – Arva realized the Ultra shovel was more than strong enough but as always, could be lighter. Weight savings cutouts have been implemented in low stress areas in order to save weight even further. Will this fit into the Ultimate Direction skimo 18 pack compartment? Hey Mike! Indeed it will! It'll be kinda tight in the S/M but it still fits! It fits great in the M/L though! We went through this experiment once before actually! Find it here under the "Reviews" tab! I see. 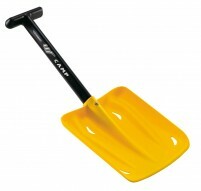 What recommended shovel for the S/M size that I got for Christmas? Hey Mike, sorry for the slow reply. I like the Mammut Alugator Light because of the small blade (slightly larger than this Ultra, but realistically it's about the same size) and collapsible handle. any way i can get a replacement blade? mine bent out shape at the neck. can you guys order that thru arva? Hi Anthony, yes we can get a replacement blade. Unfortunately we won't have stock until fall; we'll contact you then. Overall: Five Stars for by far the lightest metal-bladed shovel. If your only goal is to meet the ISMF reg, then you can save about an ounce and a half (plus some $) by buying the CAMP Crest. And if you want a larger blade for moving unconsolidated winter snow, then the CAMP Plume might be a better choice with a relative weight penalty of less than four ounces. But the ARVA Ultra offers an amazing combination of a fully functional “real” shovel at rando race weight (or rather, lack thereof). 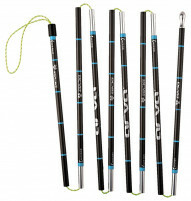 Background on product familiarity: For the 2012-13 late-spring/early-summer season I used the slightly heavier predecessor, the ARVA Snow Pure Light, which had a shorter and thinner shaft, combined with a reinforced composite blade. For the 2013-14 late-spring/early-summer season, I then switched to the Ultra. First, the first impressions out of the box: Although obviously small, this shovel seemed “real” enough that I was sure it had to be far over its spec weight, given the metal blade and sufficiently long shaft. But the spec is spot on, so it is indeed about half the weight of a typical compact shovel. The shaft end is nicely plugged and inserts reliably into the shaft. But I noticed some looseness in the connection. This prompted me to check some of my other shovels, whose varying looseness I kind of noticed for the first time. Still though, something about the combination of the carbon fiber shaft and the loose fit concerned me more than on my other shovels. But after wrapping some tape around the base of the shaft, the fit is now just right: secure yet still very easy to assemble. Second impressions, in use: The plastic “T” handle is fine for gloved hands (but might be too small for mittens). The “neck” on the blade entails a longer effective packing length, but it still fits fine in the small outer compartment of my original-generation Dynafit Broad Peak 28. Third impressions, for long-term durability: The blade material seems relatively thin, and the neck weld is relatively short. For backcountry companion rescue with good technique (i.e., chop then lift, not pry! ), I think the Ultra should be fine. But for snowpit work, well, you want a larger blade anyway, so somewhat of a moot point, as the Ultra’s sole intended purpose is emergency rescue. What is 18 + 0?